The preferred solution for evacuation. 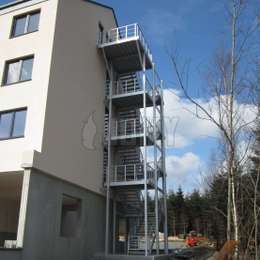 Stairs are considered as the preferred solution for safe emergency evacuations and fire escapes. There are 4 important parameters for the design: the dimensioning, the choice of material, the layout and the available options. Equipment can be carried easily (firefighters and police). Equally useful for our beloved pets. New modules can be added later on with ease. 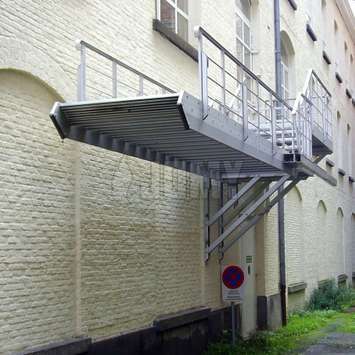 Evacuation stairs need to be stable and trustworthy at all times so they may not be worn by rust. 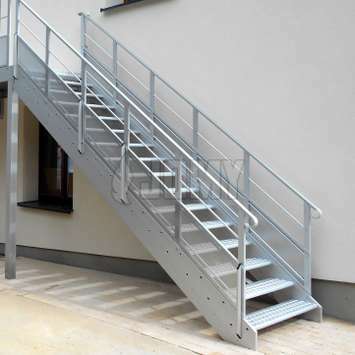 For this reason JOMY stairs use only high quality aluminum that is anodized for extra protection. They also need to comply with local building codes and approval of coding officials and fire brigade. 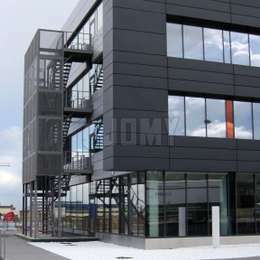 JOMY has the knowledge and experience all over the world to get the JOMY stairs certified. 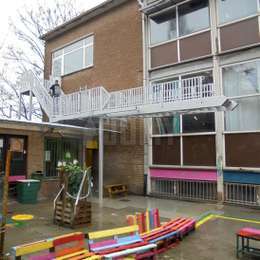 Concrete: rarely used for an additional exterior staircase - not used by JOMY. Limited costs. Easy to apply. Easy to manipulate. Lower costs for transportation, logistics and assembly. Low weight and meccano - assembly, no crane needed. Heavier and more cumbersome structures. Crane needed for mounting. Multiple maintenance and/or paint jobs required over lifetime. Melting point: Alu: 660 °C / Steel:> 1400°C. The difference in melting point is of little relevance. 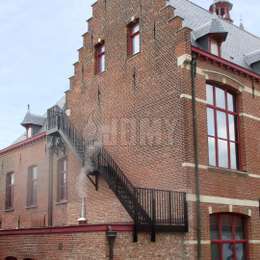 Above 80 ° C, the staircase is unusable in practice for evacuation. These two materials can lead to identical functionnalities. 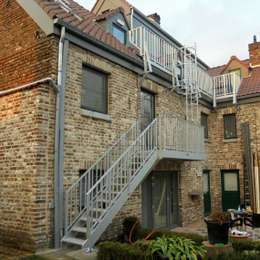 In general, steel constructions will be slimmer and aluminium ones more practical. Maintenance: over time, corrosion problems occur with damage to the galvanizing layer or protective layer. Environment: Recyclable in first cycle. Causes problems starting from secondary recycling. Zinc (galva) occurs in nature under influence of acid rain (heavy metal pollution). 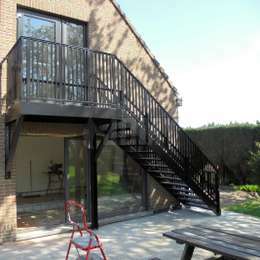 Aluminium is a much more durable material than galvanised steel. Other lay out configurations are also developed on request. 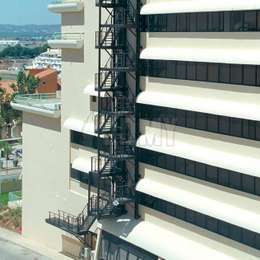 The support structure can be of 2 kinds: the classic self-supporting structure mounted on columns; or it can be a suspended structure, mounted on brackets that are suspended from the façade. 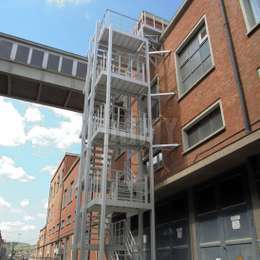 There are multiple options available for egress stairs to improve safety.